Diocese of Cloyne, County Cork, Ireland. 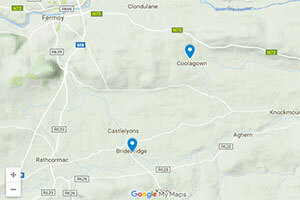 Céad míle fáilte to Castlelyons Catholic parish website. 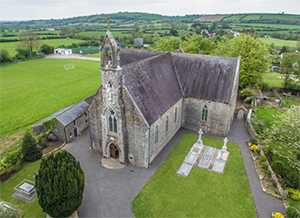 Whether you have recently moved into the parish of Castlelyons or have been a Parishioner for many years, we hope you will find our website interesting, informative and useful. Our website is intended to be a source of information about our parish for locals and visitors alike. If you are from the Parish but now living away from us remember, you will always be part of our Parish and feel free to let us know where and how you are. Being an active member of the parish family enables us to grow spiritually, to put our faith into action, and to use our gifts of time and talent as disciples of Christ. We are also very happy to welcome people who wish to be involved in our parish in any capacity: member of an existing group – Lectors, Extraordinary Ministers of Holy Communion, Collectors, Choirs, helping with altar Servers, ……….and new ideas and initiatives are welcome. Eucharistic Adoration - in the Prayer Room Castlelyons on Tuesday: 7.00 – 9.00pm. Saturdays: after the 7.30 p.m. Mass. V. Rev Gerard Coleman, P.P. Parochial House, Castlelyons, Co Cork.